So it’s story time, and as you know at the end of a good story, you’ve usually learned a thing or two or tree. That being said, I was working on a client’s house last week, being my usual friendly self, and happened to walk by a massive chunk of wood sitting on the ground next to the house. 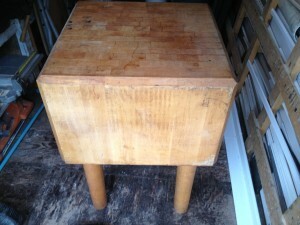 What it was, was at a full size professional butcher block, on its side, minus the legs. We where working on the house for three days, and this being day one, I had to figure out a strategy to acquire my new-found love. In my mind it was already loaded into my truck. It wasn’t until I got home that I realized that what I thought was the massive top, was actually the massive side. Two feet by two feet wide, the block is a beast! And this is coming from a guy that lifts heavy things all day, every day. I have no doub that this thing weighs in at a cool 230lbs. 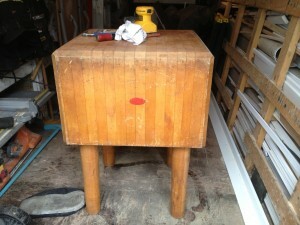 How to revive a butcher block is the same across the board. From the 50$ blocks all the way through. If you have a chunk of wood that you cut food on, then this is the plan. I had to start from scratch, so immediately out came some 100 grit sand paper and a palm Sander. Now first you have to make a judgment call when it comes to the kind of music you want, because you’re gonna have to turn it all the way up. READ: SANDING TUNES ARE A MUST BECAUSE SANDING IS HELLA BORRING. Secondly, when you’re sanding you will notice black goo collecting on the sand paper. This is the oils in the wood collecting, so you will go through a lot of sand paper. In my case, after a good solid three hours, boom! A giant sanded block of Kentuck Maple. Now the fun part, take this thing home pick your spot and there it shall stay. All of these directions apply to your standard cutting board as well. If you do have a cutting board that you ignore and wonder why you have to buy a new one every couple of years, then this next bit is for you. To treat a cutting board you need to use what’s called food grade mineral oil. 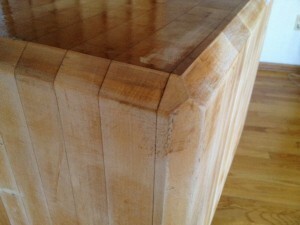 The reason is that it will not go bad and make your cutting board a breeding ground for gross bacteria. Almost all other oils might make you sick over time. The only place in town that I found it was at London Drugs, a local pharmacy. Might as well buy your embarrassing items now because right on the bottle it says laxative for constipation, so grab your condoms and lady things, maybe a trashy magazine and you’re out. The oil should only cost 6$ for 500ml. Get home, get a piece of cotton and oil that thing up. You really cannot add too much oil. No you don’t want to dump too much on, only because it will drain off onto your floor. Apply the oil and in about 4hrs you will notice the oil is gone and the wood has absorbed it. 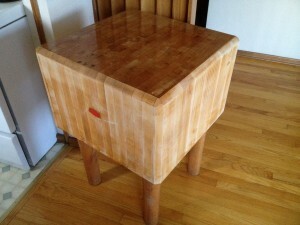 The butcher block I was oiling was a monster so I oiled it everyday, all the time for a week. The final step is up to you. It’s not necessary, but heck, you’ve gone this far. Go to your local fancy kitchen store and by block cream. It should really only have two ingredients, one being mineral oil and the other is unbleached bees-wax. This gives your board a really nice shine and also protects it while filling in the cracks caused by normal wear and tear. So a week from Lupos arrival in my loving arms, we have this little gem. When I was buying the wax the man behind the counter asked me what kind of board it was for. I showed him a picture of the block and told him my story, and after he picked his chin up off the ground he said “That block in any condition is worth at least 1500$.” He was really happy that I got it and was bringing it back to its original life. So now you know how to care for your wood cutting boards. If you take care of it and oil it once a month, you will have it for ever. And I really mean for ever. This is fantastic. Nice one, B.